The pinna, or external ear, acts as a funnel to gather and channel sound into the ear canal. 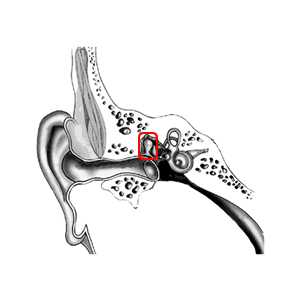 The auditory canal (ear canal) is a small tunnel which leads to the eardrum. It acts to amplify sound and funnel it towards the eardrum. The eardrum membrane is the consistency of cigarette paper. Sound waves bounce off the membrane causing movement, which is transmitted to the ossicular chain. The ossicular chain is made up of the malleus, incus, and stapes. The malleus (hammer) is the first bone of the ossicular chain, and is attached to the eardrum. Vibrations of this bone are transmitted to the incus(anvil), which is the second bone of the ossicular chain. 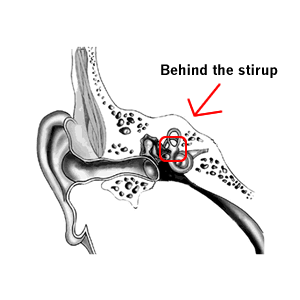 Movement of the incus is transferred to the stapes (stirrup), which is the third bone of the ossicular chain. Incus (anvil) is the middle bone of the ossicular chain. It transmits the mechanical energy from the malleus to the stapes. The stapes(stirrup) is attached directly to the oval window of the cochlea. Vibrations of the stapes are then transmitted to the fluid-filled cochlea. The cochlea is a fluid-filled organ essential for the transduction of mechanical (vibration) energy to electrical (nerve impulse) energy. Vibrations from the stapes on the oval window cause waves within the fluid, which causes the basilar membrane to move. The movement of the basilar membrane causes a shearing action of hair cells (outer and inner). The hair cells transmit nerve impulses away from the cochlea and toward the brainstem via the auditory nerve. The auditory nerve sends the impulses to the brain and the brain perceives the impulses as sound. The semi-circular canals are the organ for balance. It has three fluid-filled cavities oriented in different planes to give information on movement and acceleration in all directions. The eustachian tube is a small tube connecting the middle ear space to the back of the throat. It is primarily used to equalize pressure between the outside world and the middle ear space, and usually opens and closes each time you swallow.